Planet formation is a complex and tumultuous process that remains shrouded in mystery. Astronomers have discovered more than 3,000 exoplanets—planets orbiting stars other than our Sun—however, nearly all are middle-aged, with ages of a billion years or more. For astronomers, attempting to understand the life cycles of planetary systems using existing examples is like trying to learn how people grow from babies to children to teenagers, by only studying adults. Now, a team of Caltech-led researchers have discovered the youngest fully-formed exoplanet ever detected. The planet, K2-33b, at 5 to 10 million years old, is still in its infancy. The first signals of the planet's existence were measured by NASA's Kepler space telescope during its K2 mission. The telescope detected a periodic dimming in the light emitted by the planet's host star—called K2-33—that hinted at the existence of an orbiting planet. Observations from the W.M. Keck Observatory in Hawaii validated that the dimming was indeed caused by a planet, later named K2-33b. A paper detailing the finding appears in the June 20 advance online issue of the journal Nature. "At 4.5 billion years old, the Earth is a middle-aged planet—about 45 in human-years," says Trevor David, the first author on the paper and a graduate student working with professor of astronomy Lynne Hillenbrand. "By comparison, the planet K2-33b would be an infant of only a few weeks old." "This discovery is a remarkable milestone in exoplanet science," says Erik Petigura, a postdoctoral scholar in planetary science and a coauthor on the paper. "The newborn planet K2-33b will help us understand how planets form, which is important for understanding the processes that led to the formation of the earth and eventually the origin of life." When stars form, they are encircled by dense regions of gas and dust, called protoplanetary disks, from which planets form. By the time a young star is a few million years old, this disk has largely dissipated and planet formation is mostly complete. The star orbited by K2-33b has a small amount of disk material left, indicated by observations from NASA's Spitzer space telescope, demonstrating that it is in the final stages of dissipating. 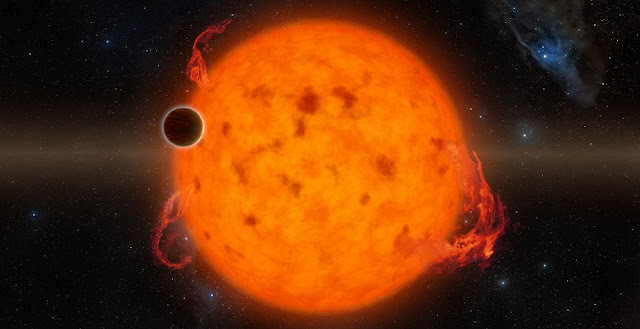 K2-33b was previously identified as a planet candidate in a survey of stars done with the K2 mission, the extended mission phase of the Kepler Space Telescope. "Astronomers know that star formation has just completed in this region, called Upper Scorpius, and roughly a quarter of the stars still have bright protoplanetary disks," David says. "The remainder of stars in the region do not have such disks, so we reasoned that planet formation must be nearly complete for these stars, and that there would be a good chance of finding young exoplanets around them." K2-33b, like many other exoplanets, was detected due to the periodic dimming in the central star's light as the planet passes in front of it. By studying the frequency of dips in the star's light and measuring by how much the light dimmed, the team was able to determine the size and orbital period of the planet. K2-33b is "a remarkable world," according to Petigura. The exoplanet, which is about six times the size of Earth, or about 50 percent larger than Neptune, makes a complete orbit around its host star in about five days. This implies that it is 20 times closer to its star than Earth is to the Sun. K2-33b is a large planet like the gas giants in our solar system. In our solar system these giant planets are all far from the Sun. As it turns out, the proximity of the giant planet K2-33b to its star is not too out of the ordinary for planets in our galaxy—many have been discovered "close in," often completing an orbit around their parent star in weeks or even days. The explanation for this is that large planets can be formed far from their star and migrate inward over time. 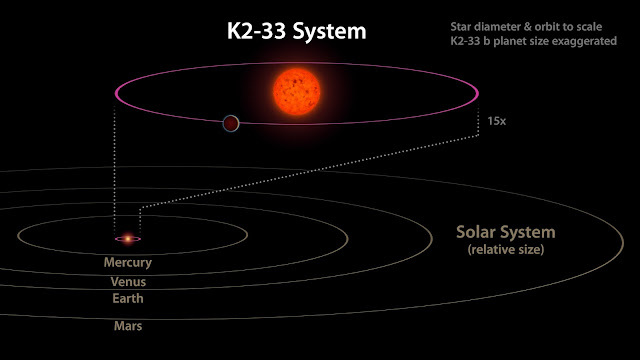 The position of K2-33b so close to its parent star at such an early age implies that if migration occurred, it must have occurred quickly. Alternatively, the planet could be evidence against the migration theory, suggesting that giant planets can in fact form close in to their stars. "Discovering and studying K2-33b required using several of the most powerful astronomical instruments available, both in space and on Earth," says Sasha Hinkley, now a senior lecturer at Exeter University and co-author on the study. As a NASA Sagan Postdoctoral Fellow at Caltech, Hinkley acquired data from the Keck telescope which was later used to help confirm the existence of the planet. K2-33b is fully formed, but it may still evolve over time. The next step is to measure the planet's mass and determine its density. These measurements will offer insights into the planet's fate later in life—whether it will stay roughly the same size or if it will cool and contract. "In the last 20 years, we have learned that nature can produce a staggering diversity of planets—from planets that orbit two stars to planets that complete a full orbit every few hours," Petigura says. "We have much to learn, and K2-33b is giving us new clues." The findings are detailed in a paper titled, "A Neptune-sized transiting planet closely orbiting a 5–10 million-year-old star." The work was supported by a National Science Foundation Graduate Research Fellowship and included data funded by NASA. Professor Lynne Hillenbrand, staff scientist David Ciardi, and senior faculty associate in astronomy Charles Beichman were additional Caltech coauthors on this paper.